Scrubbing the channels with warm water and a dishrag. In spite of the gorgeous rosette of green leaves adorning each plant are a forgotten, bulky portion of roots. These hardworking organs uptake nutrients, excrete chemicals and provide support for the plant, yet, often go unnoticed to most people. One great aspect of hydroponic growing is noticing every aspect of the plant. For me, it was quite surprising to see thick root masses underneath the eye catching leaves. Lettuce pulled from soil never gives justice to really the density and amount of roots the plant creates for a successful life. The cleaning begins with each channel’s tube being kinked. This small, two inch piece of plastic is responsible for getting the water from the pipes to the plants. The tube is kinked with an inexpensive clothes line pin. Each channel is pulled out from the main pipe that cycles the nutrient water back into the tank. After each channel is pulled from the main pipe,the top of the channels are pulled off. The root mass is removed from the channels. Many times, the root masses of multiple plants are intertwined, allowing the entire six foot channel to be rolled into one massive ball. After harvesting eighteen Kale plants, I opened the channels to find a six foot long, two inch thick root mass almost busting out of the channel. Other times, I’ve found each plant’s roots isolated. Each channel and top of the channel is thoroughly scrubbed with warm water and a rag. A root mass with some stem portion at the end of one channel. This plant’s roots were actually inside the main pipe. No cleaning chemicals (such as bleach or soap) are added to the water. This is to prevent the possibility of any contamination of the nutrient water. After the channels have been thoroughly scrubbed, the tops are replaced and water is squirted down the channel to remove any roots or plant pieces prior to reconnecting to the main pipe. The channel is then inserted into the main pipe and the tube is un-kinked. Before the channel is replanted, water is confirmed to be running throughout the channel. It may seem idiotic to emphasize water running in a hydroponic channel, but many times, the tube is merely trickling with barely enough water to feed and hydrate one plant. By determining this before planting, we save time, money and patience. 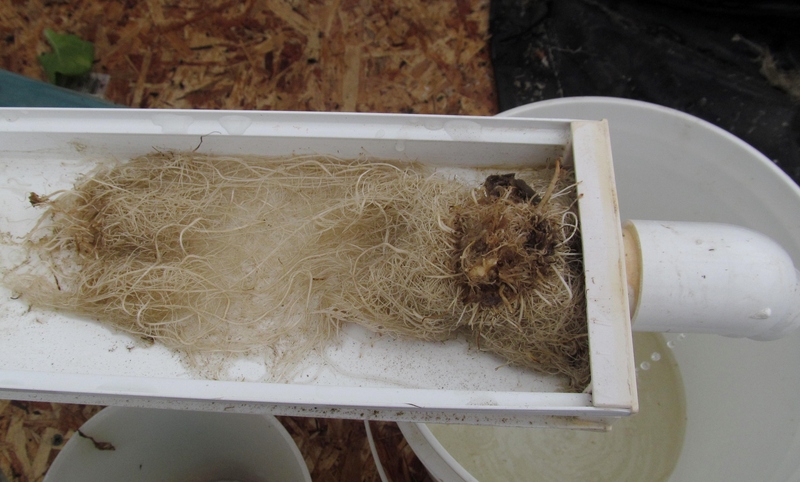 One issue in hydroponics is attempting to control the growth of the roots. Roots are constantly shed from the plant. Given the flowing of the water, this allows the entire system to be shut down literally by a small portion of the plant. It’s a delicate balance between harvesting as large a plant as possible without allowing the roots to completely fill the channel and beyond. Remember, the more roots a plant has, the more nutrients it needs. Huge root masses can really drain the water tank. Kinking the line. A 10 cent piece of plastic saves the day! It is important to note that many times, roots are not the only thing in the channels. Algae, leaves and bugs also adorn the inside of the channels. Algae, of course, uses up nutrients in the water and competes with the profitable lettuce. Leaves can clop up the filter, tubes or pipes, devastating rows of plants. While bugs may also clog the system, they devour lettuce and create an unappetizing, “unhealthy” look. To many people, hydroponics is a monotonous system. Yet, I’ve found passion working with hydroponic lettuce and kale. Harvesting lettuce I planted fills me with more pride than I previously would have thought. Many times, customers have stopped me to learn more about the hydroponic system and are shocked to see the transformation of a two leafed “infant” plant into a robust “adult” beauty. 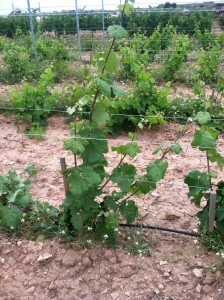 Here in this region of Alicante there is a special tradition with the table grapes. It’s called ‘embolsando’ or the bagging of the clusters. At Casa Sicilia we primarily have wine grapes but also about 25 hectares of table grapes. The farms in this region cultivate a variety of table grape called Aledo, which is only grown here in Novelda and its surrounding towns. 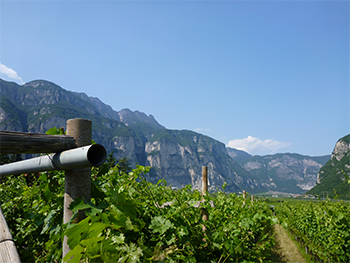 This variety is special because it is harvested in November and December and there is a tradition with this specific grape at the end of the year. Each person has toe at 12 grapes in the last 12 seconds of the year in order to have good luck the following year. Almost all of Spain eats the grapes from here in Alicante on this night. Why do we have to but bags on all of the grapes? 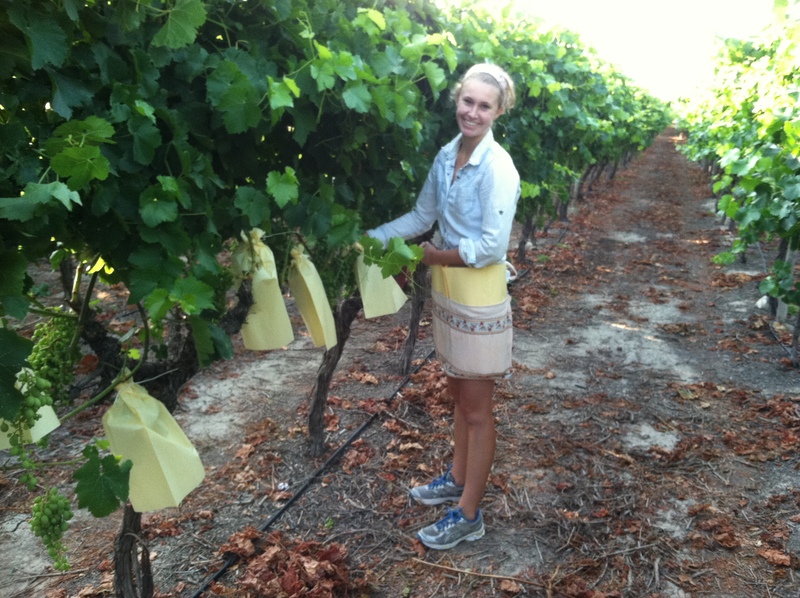 We put them on each cluster to make sure they are protected and look absolutely perfect by the time they are harvested in December. I have never seen anything like the embolsano. The rows and rows of grapes are full of White bags tied with string, it looks pretty weird if you don’t know what it’s for. 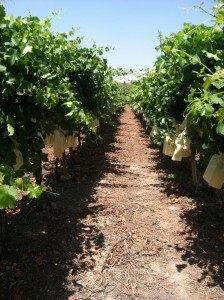 The bags protect the grapes from bird damage, insects, and the sun. When the clusters are big, but not ye tripe, they put one bag on each cluster. It is a job but a lot of people from the town help in the farms during the weeks of embolsando. This week I helped and woke up each day at 6 to start with the team at 7. We work until 10 for a break and then continue until 2 in the afternoon. The farm pays per thousand bags you put, so everyone Works very quickly in order to use as many bags as possible in a day. It is very impressive to watch how fast some of the workers go. The best ones can put 2 thousand in one day. 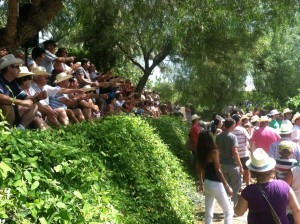 This Sunday was the embolsando contest of Novelda here in the farm that I work at. All of the fasted “bag-tyers” came and competed. It was a really fun event with music and tapas. 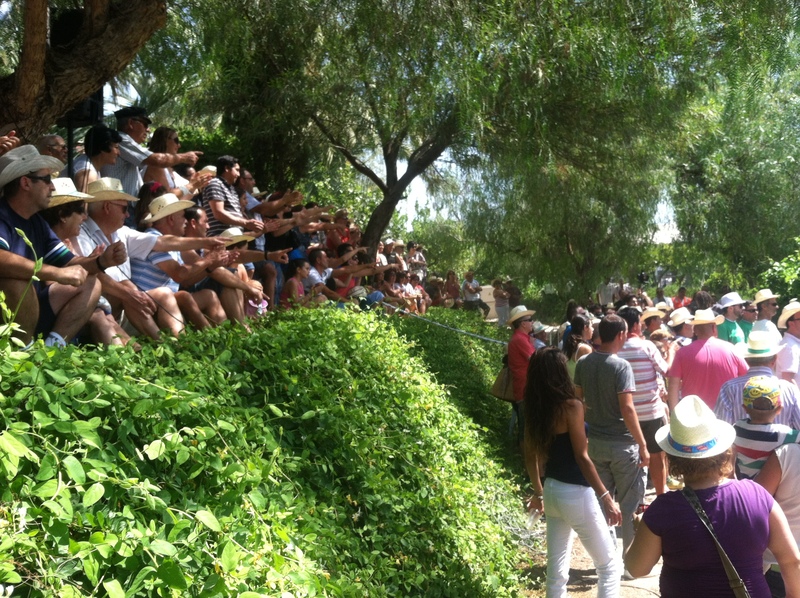 There were 20 contestents and a lot of people to cheer them on. They had to put 200 bags and the winner did it in 26 minutes. Which is actually crazy fast, I put 1000 in a total of 7 hours. It was really cool to see how the whole town comes together to help with the grape bagging. That’s all for now, Hasta Luego! Aquí en esta zona hay una tradición muy especial en la uva de mesa. La ocurra cada año durante el mes de julio. Se llama el embolsado, y nunca he visto nada como este antes. Las filas de la uva son llenas de bolsos con hilo. Las fincas en este región cultivan una variedad de uva de mesa que se llama Aledo y está solo aquí en Novelda y los alrededores. La uva es especial porque la vendimia es en noviembre y diciembre y hay una tradición con esta uva particular en el fin del año. Hay que comer 12 uvas en los 12 últimos segundos del año a dar suerte. Casi todo España come la uva de aquí en esta noche. Porque tenemos que poner los bolsos? Porque quieren que en diciembre la uva estará perfecta y los bolso protegen de todo, los insectos, los pájaros, y el daño del sol. Ponen un bolso cada racimo cuando están grandes pero no maduras. Es un trabajo muy pesado pero mucha gente del pueblo ayuda en las fincas. Esta semana he participado en el embolsado de la uva. Me desperté a las seis a empezar con el equipo al las siete. Trabajamos hasta diez a almorzarnos y después continuamos hasta las dos. La finca te paga cada mil bolso que pones y por eso los trabajadores van muy rápido. Es muy impresionante a ver que rápido mueven las manos. Ponen un saco en cada racimo y hacen un nudo con hilo. Los mejores pueden poner dos mil en un día. Este domingo fue el concurso de embolsado aquí en la finca donde trabajo yo. Había 20 concursantes y mucha gente a aclamarlos. Tuvieron que poner dos cientos bolsos y el hombre que acabó primero puso los dos cientos sacos en 27 minutos. Fue un evento muy divertido con bebida, tapas, y música. Fue muy chulo a ver como todo el pueblo ayuda con la uva durante este mes. 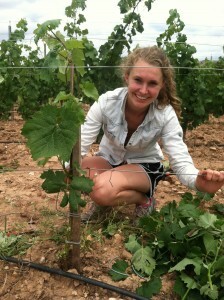 Over the course of my internship thus far I have been to several field days covering a wide range of subjects. Field days are usually put on by a Cornell program located here on campus or through the Cornell extension service. The purpose of field days is to share information regarding different research that is currently going on through Cornell. Generally the audience consists of farmers, extension agents, consulting firms, and other Cornell researchers. Presentations are given about each of the projects at the given location usually in addition to a tour of the facilities. One of the first field days I attended was the small grain grower’s field day. This field day was almost entirely focused around the recently passed farm brewer’s bill. Due to the lack of barley and other small grain crops being grown for malting, these researchers were quite busy this year testing a wide range of varieties to determine which grow best in New York’s climate. In addition to being able to grow well, they must also be of high malting quality. This narrows the options down quite a bit since the quality needs to be top notch in order for the crop to be used for malting. 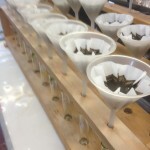 Growers are extremely interested in the results of this research as many of them are likely going to be growing crops that will be used for malting as a result of the farm brewer’s bill. 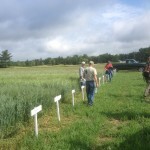 The next field day I attended was the forage yield monitor field day. 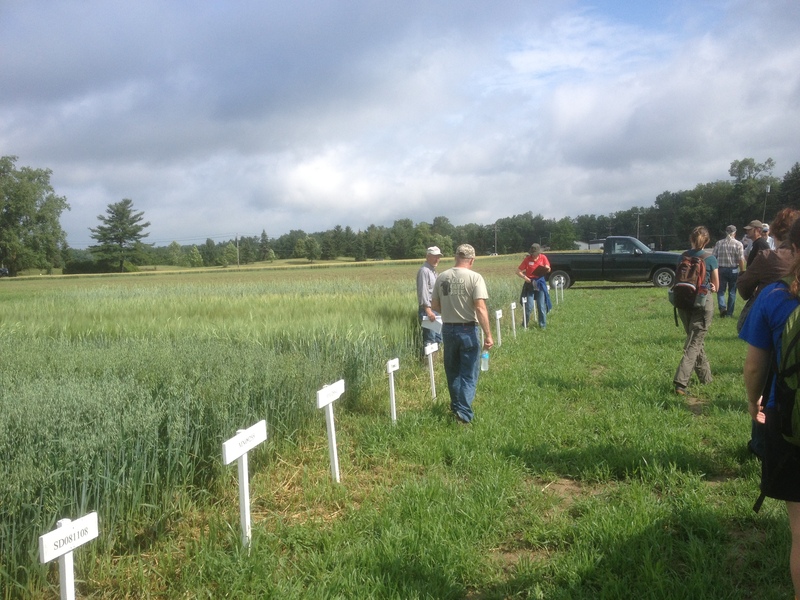 This field day was hosted by Gary Swede Farms, Agrinetix, and the Cornell Nutrient Management Spear Program (NMSP). 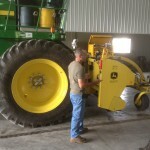 This was mainly put on to provide information about forage yield monitors such as the importance of forage yield monitors, how they work, calibrating the monitors, and constructing yield maps from the collected data. The NMSP’s project looking at the accuracy of the yield monitors was also presented showing some preliminary results. The most recent field day I attended was the Aurora Farm Field Day. 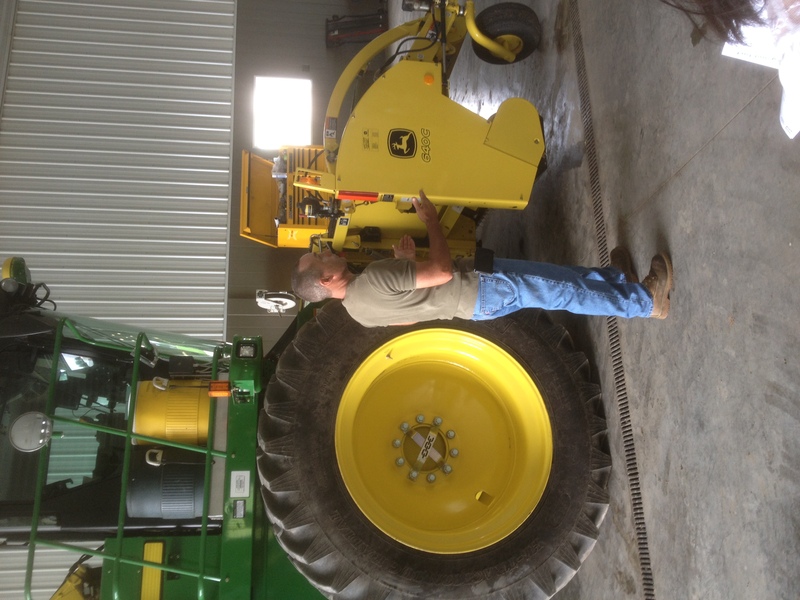 It took place at the Aurora research farm, where there are numerous research projects including several which belong to the Nutrient Management Spear Program. One of the projects presented was looking at planting date and planting depth of corn and soybeans. Several other studies were variety testing of corn and other forage crops. One study that I found to be of particular interest was a fairly new piece of equipment which is used as an inter crop seeder. 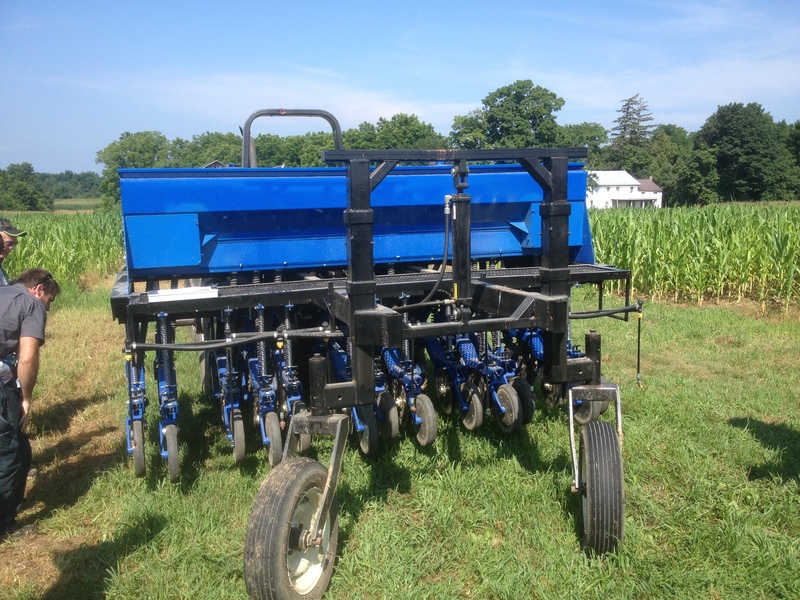 The purpose of the machine is to go over corn when it is about waist high and plant the cover crop which is to follow the corn once it is harvested. 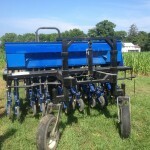 This helps the cover crop by having it establish earlier to increase the benefits it provides. Another presentation that covered a fairly new piece of equipment was one by the NMSP. 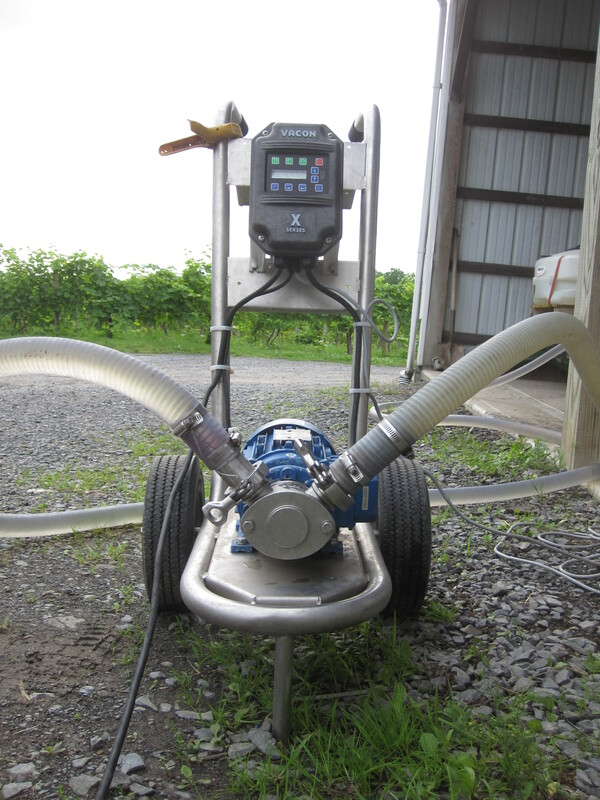 The piece of equipment was a small scale manure injector that just arrived from Penn state. This will be used in the future for a study comparing different injection rates and application methods. Unfortunately, this presentation had to be done indoors due to some unexpected afternoon showers! Since I’ve been in Virginia I’ve worked at 4 farmers markets in the area; Harrisonburg, Rockbridge, Staunton and Lexington. I went to Harrisonburg and Stuanton with Mountain View Farm Products and Lexington and Rockbridge with Cherry Ridge Farm. 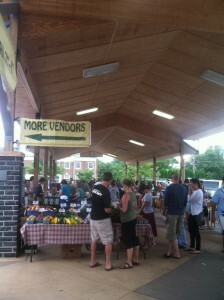 Harrisonburg Farmers Market is one of the largest in the Shenendoah Valley area. It’s set up in similar in Ithaca’s since it is also located in a large wooden pavilion. It is open Tuesdays and Saturdays and is a highly competitive market for vendors. The market managers and staff look for unique products and crafts like handmade dog collars, glass blowing and wood carvings. Along with these specialty items, they also have vendors that carry traditional vegetables and produce. Harrisonburg only accepts vendors that sell products that were made or grown directly from their farm. This helps ensure that customers are getting and supporting local products. Harrisonburg also allows credit transactions because their volunteer booth uses a system where they can swipe credit and debit cards and exchange it for wooden tokens that can then be used as money with the vendors. This system also takes food stamps and then the market matches the amount. For an example, if someone had a ten dollar food stamp, the market would give them another ten and they would have twenty to spend. The market also has a cooking demonstration that offers benefits for low-income individuals if they come and watch it. This demonstration also uses ingredients from the market. 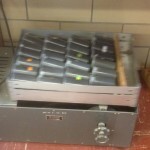 I believe that this system is extremely beneficial to people in the community and helps promote healthy eating. Marketing is very important to farmers markets. Many markets in the area had Facebook pages and used other social media sites to help promote the market, vendors and help increase awareness of the local food movement. The Rockbridge, Stuanton and Lexington markets are much smaller and are not located in a pavilion or other infrastructure. For these markets the vendors bring tents and set them up in a designated parking lot. 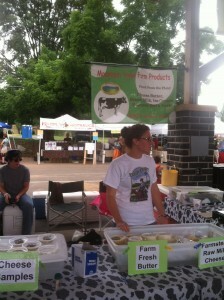 They also require all vendors products to be brought and produced directly on their farms. Some of the markets are very competitive. 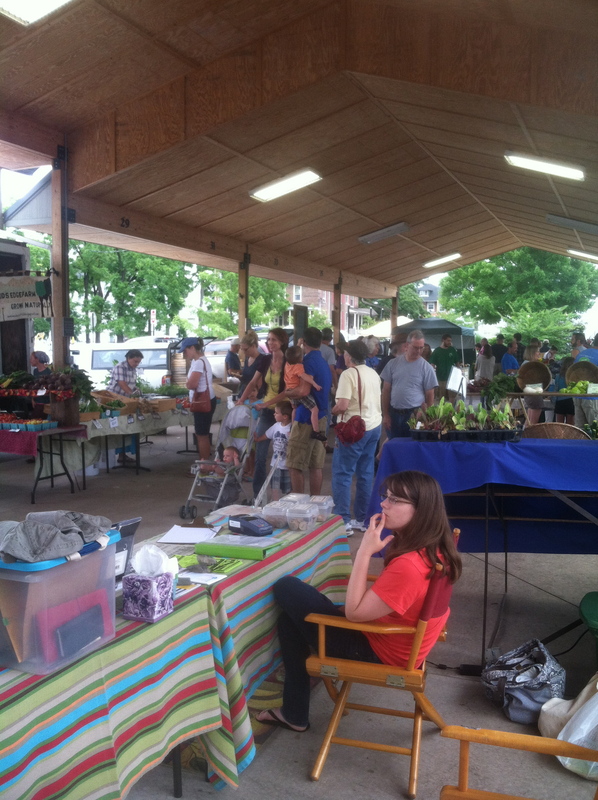 There is a huge waiting list for the Harrisonburg market and a lot of politics involved. The Lexington market is also pretty picky about the vendors they let in. These systems showed me how important it is to have unique products, plants, produce and crafts. Value added products seemed to sell well because there was an abundance of beautiful produce. Its hard for vendors to compete and most of the markets had set prices for more mainstream produce. 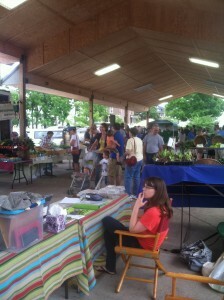 Marketing for the volunteers and organizers of the farmers markets is vital. Marketing for vendors is also extremely important. Set up, product displays and speaking with customers all play pivotal roles in this process. Being friendly, inviting and informative is also important when dealing with customers and I gained experience and confidence in all of these areas. I was also able to meet a lot of wonderfully interesting customers and other vendors. 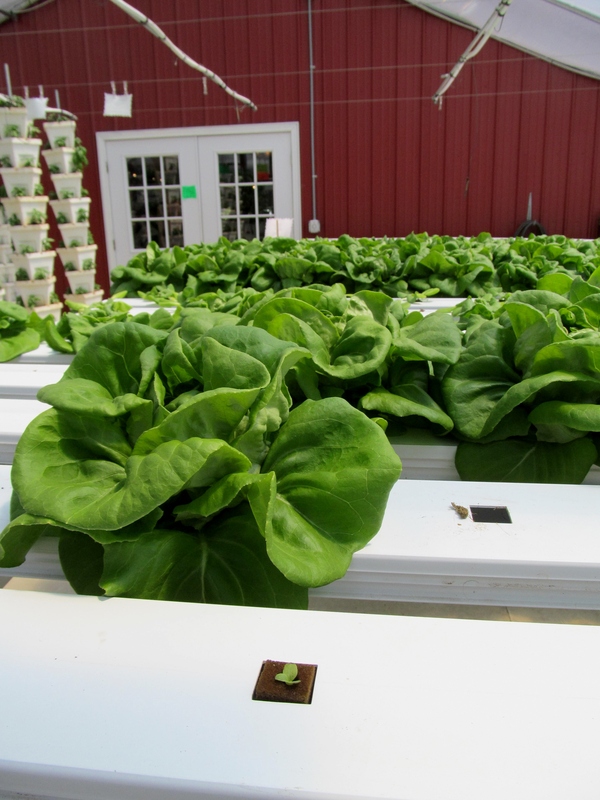 Hydroponic lettuce at four weeks and one week. Greetings from western Pennsylvania! 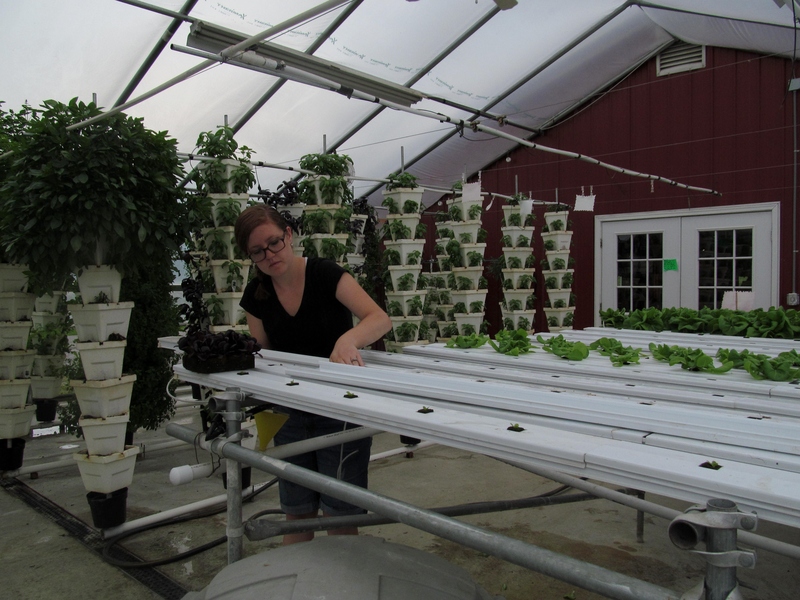 I have been learning hydroponics throughout my summer internship at Yarnick’s Farm. I have found great interest and opportunity learning about the entire system from seedling to sale. 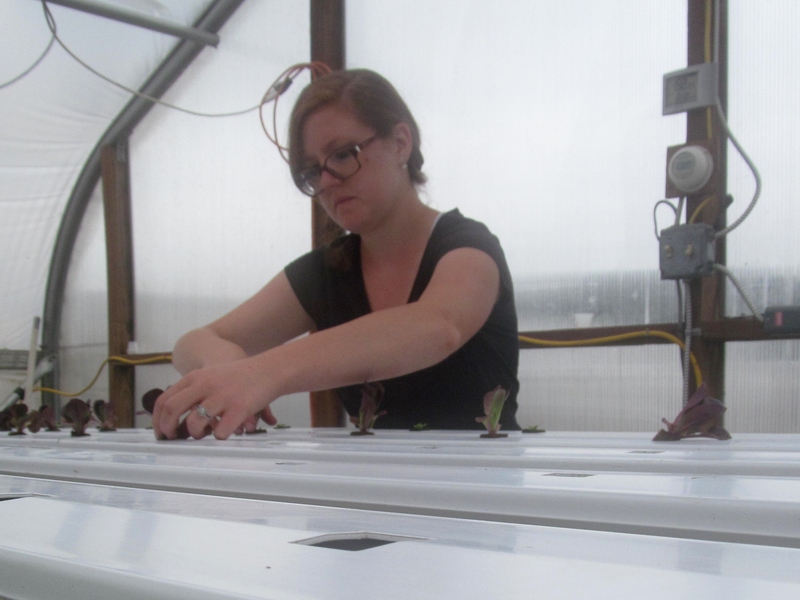 Green and Red Bibb lettuce, kale and Red Oakleaf lettuce are all grown hydroponically in the greenhouses. Plants grown without soil are considered to be hydroponically grown. Confusing as it may be, hydroponics encompasses plants grown in foam, gel, perlite, or water. 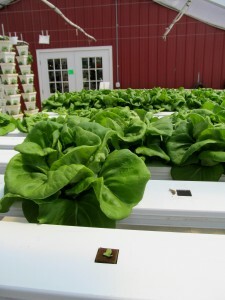 On Yarnick’s farm, the lettuce is grown hydroponically in foam and water. The process begins with a foam tray. One lettuce seed is placed in each hole in the foam tray. This tray is then watered as any normal sprouting seedling would be. The sprouting seeds must be kept in moist conditions. 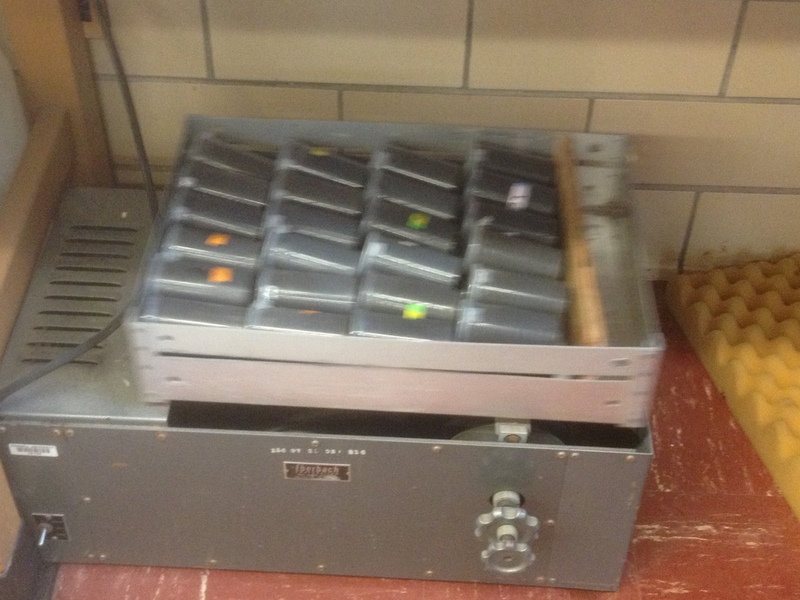 The trays must constantly be monitored; a dried tray equals a loss of seeds, foam, money and most importantly, time. After the first two true leaves erupt from the young seedling, each foam square containing this delicate seedling can be planted. Due to timing issues, the plants may have two true leaves or five beautifully developed, upright leaves. The foam squares are carefully separated. If the seedlings are damaged, have abnormal growth (sideways) or look inferior (yellow leaves, small, signs of oxidation), they are discarded or left to grow a little longer. Planting Red Bibb lettuce in the hydroponic channels. Each foam square will be planted into one channel. The foam is slightly smaller than the square hole and must be level. If the foam is slightly tilted, the plant will grow in a tilted manner. 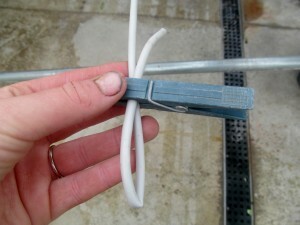 This disrupts the uniformity that the greenhouse gives a grower. It also interferes with the surrounding plant’s growth habits, causing greater uniformity problems. To many consumers, an abnormal looking plant is unappetizing, even if its nutritional value is not affected. A fertilizer is mixed into the water that is pumped throughout the system. A filter will capture roots, dirt, bugs or unwanted items that can plug the entire system. The lettuce must routinely checked to make sure it’s nutritional and environmental needs are met. If the system was to get plugged or turned off for any reason, the plants will immediately begin wilting, dying and crop loss will become inevitable. Testing the pH of a wine. 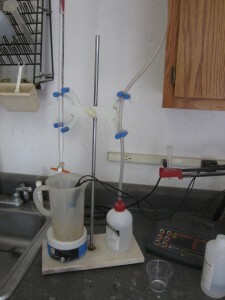 Typically, though, only SO2 is tested right before bottling (the wine’s sugar and acidity has been adjusted previously). At the beginning my summer, I began working in the vineyards and began to familiarize myself in the winery. A couple of weeks ago I mentioned some of my bottling experiences, and since then, I continued to bottle a couple days a week. However, for the last two weeks, my time is mostly divided into “bottling” and “tasting room” days. 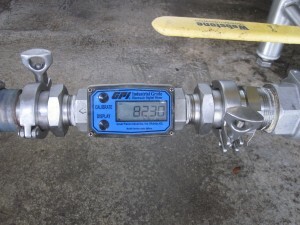 A flow meter. Used to measure the speed and total volume of wine being pumped through the attachment. On bottling days, we pump the desired wines from their tank to the tank inside the “Morton” (the warehouse building where the bottling set up is kept) to a tank. 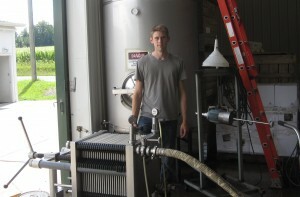 The wine is then filtered through 25 large filter pads and pumped to the bottling machine. 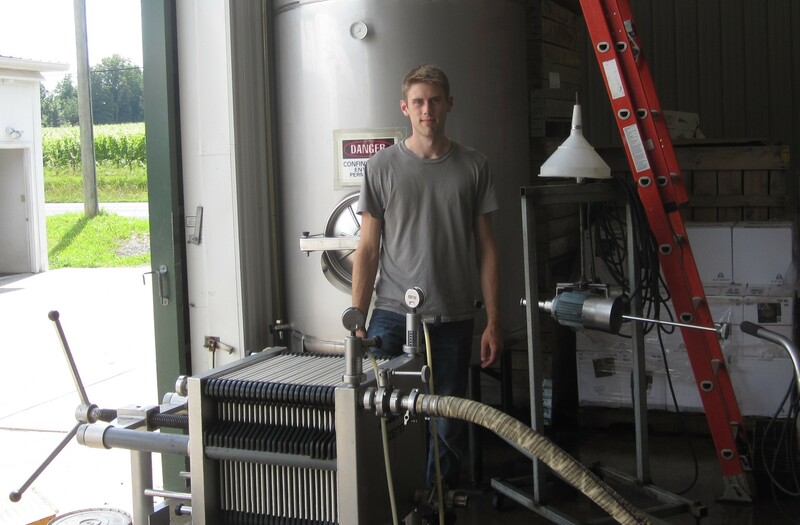 When the wine is bottled, it is transferred from the 1,000 gallon tank behind me through the filter in front of me, and pumped into the bottling machine. One of the $3,000 pumps. A wine order to transfer a few cases to the Hosmer barn Cellars. The rest of the week (and weekends) have been devoted to tasting room work. Thus far it seems that this consists of stocking wines and pouring wine for customers. Having received a set of the vintner’s notes on each of the wines, and having to convey that knowledge to customers has been a great way to get the know the products offered. 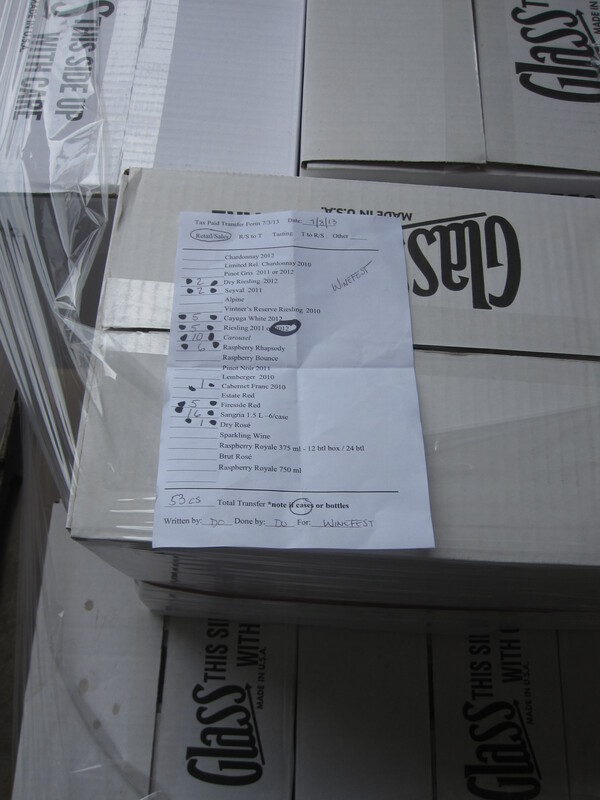 It also helps that I can then ask Aaron (the wine maker) about them in more detail on bottling days. 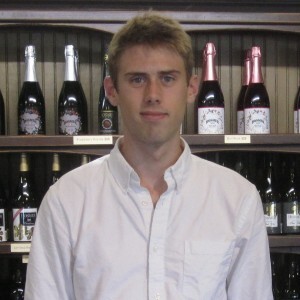 However, many of the customers would prefer to talk about their days, other wineries, or just anything else. The the days are less physically taxing than in the vineyards, with a much lower likelihood of sunburn. Instead, a long day of making small talk with strangers can be either relaxing and interesting and/ or mentally exhausting if there is a flood of customers. 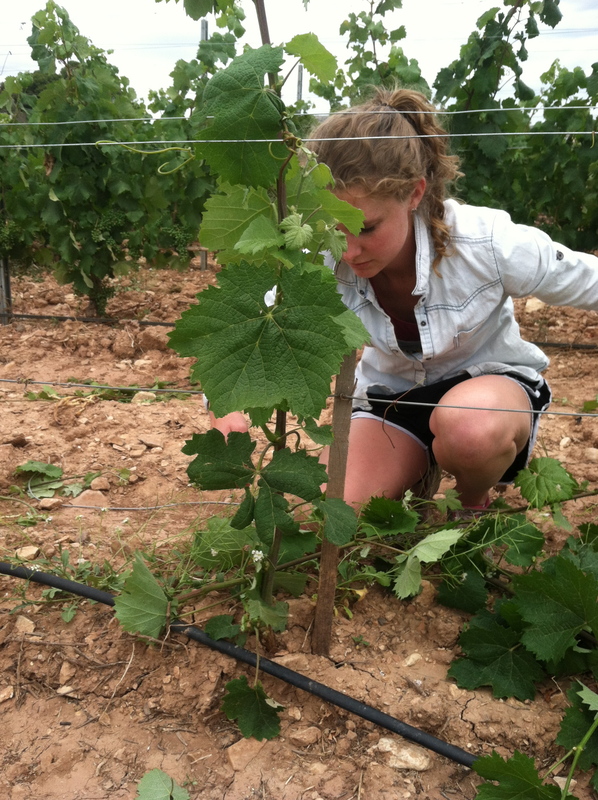 It seems that the two extremes of monotonous physical vineyard work and being accommodating and interested by everyone that walks into the tasting room are not exactly what I am looking for a career in. If I could keep switching from one to another as I have been able to do while being an intern, that would be ideal. However, there are more options, and I find myself looking toward this coming Fall semester to learn more about wine marketing from a new 2 credit class that is being offered. In my previous post, I mentioned processing the samples taken in the field for my personal project on zone tillage depth. I first put them through a grinder, as the soil needs to be fine in order to analyze it in the lab. 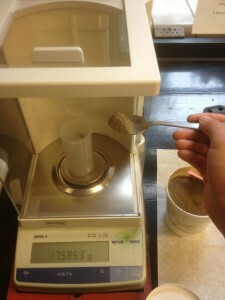 Once this is done, it is brought to the lab where 10 grams of each sample is weighed out and separated. 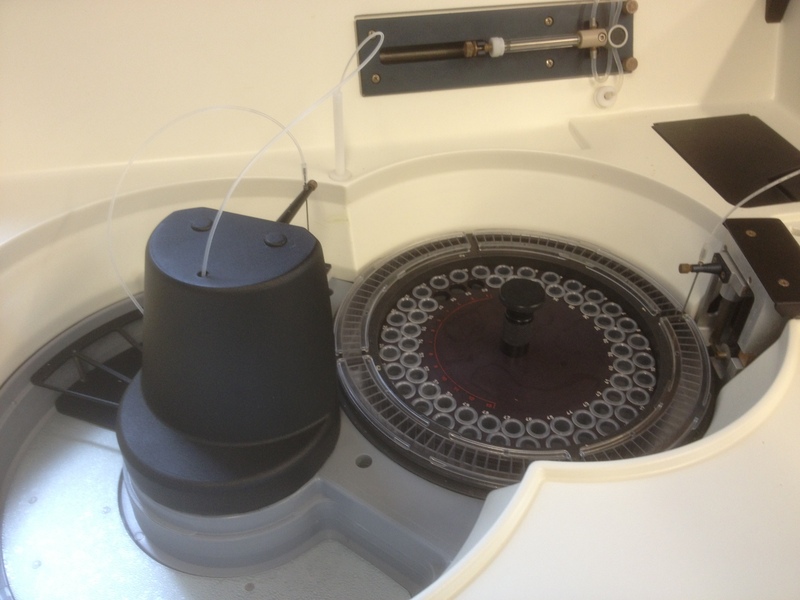 Next, active carbon is added to ensure more accurate nutrient analysis. For this project, we are only testing for soil nitrate levels. 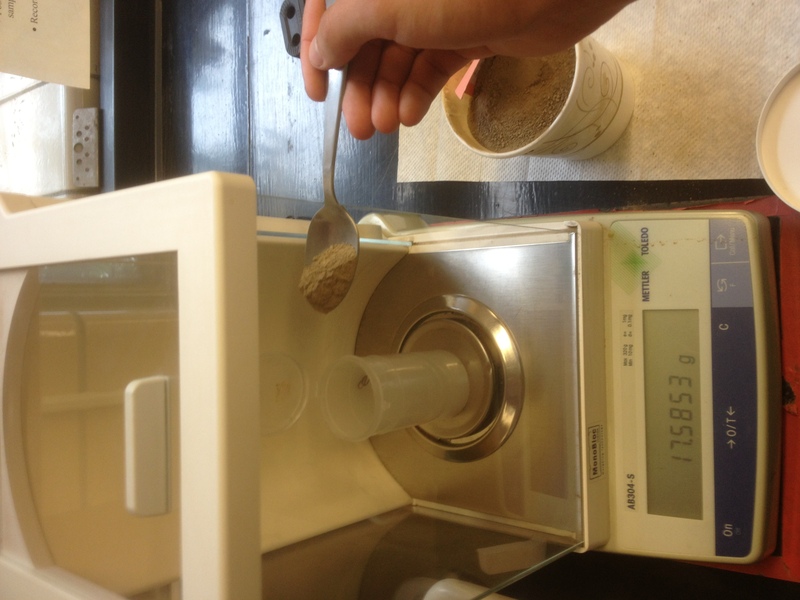 Morgan’s solution is then added to each of the soil vials and thoroughly mixed together. 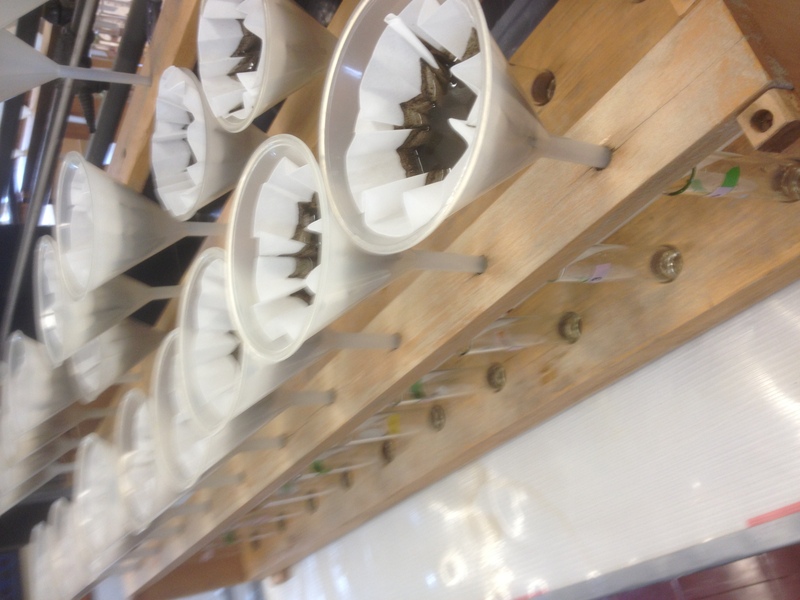 The samples then are put through a very fine filter in order to separate the solution from the solids in the soil. 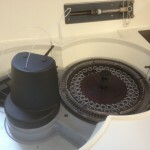 Small amounts of each of the sample solutions are then taken in order to be analyzed by the computer. This process is quite time consuming, however many samples are able to be done at once. At a glance, it does not seem like there is a significant difference between the numbers. Now the next step is to organize these results and see if any conclusions can be made. During the early months of my internship, the region I was in experienced some wacky and unusually wet weather. In late May and June we experienced heavy rain on a daily and weekly basis. Because of this, multiple farms and the community experienced different effects from this. There was major flooding of fields, roads and homes. At times sections of the bottom field at Cherry Ridge Farm were completely submerged in water for days. The rain and flooding created some negatives and positives for the farming community in the area. Some examples of these were that the outside tomato crops get diseases and died and potatoes were rotting in the ground. Another crop that was greatly effected were the hops at Whipple Creek Farm. 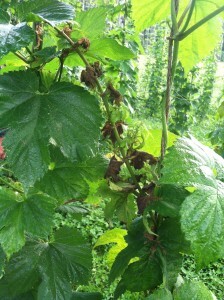 In June we realized that some of our plants had downy mildew. 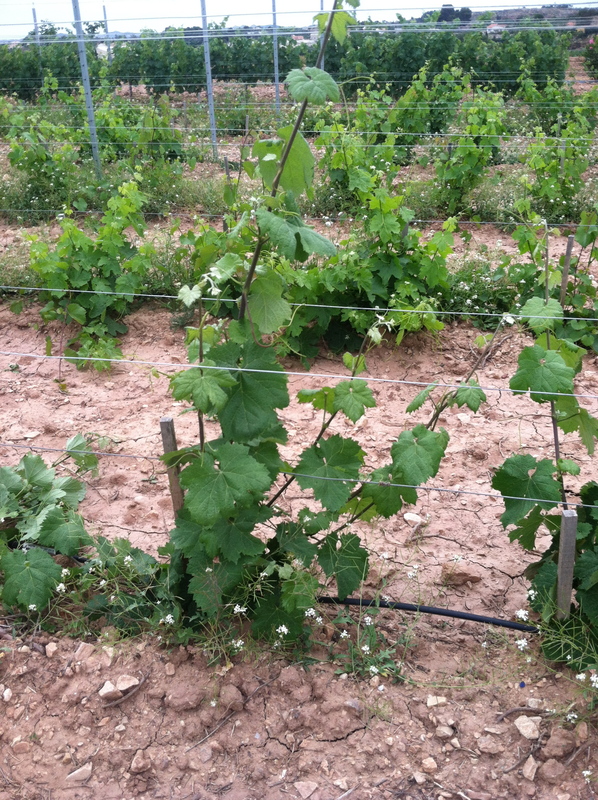 Downy mildew produces stunted shoots and yellowed spotting of the leaves. 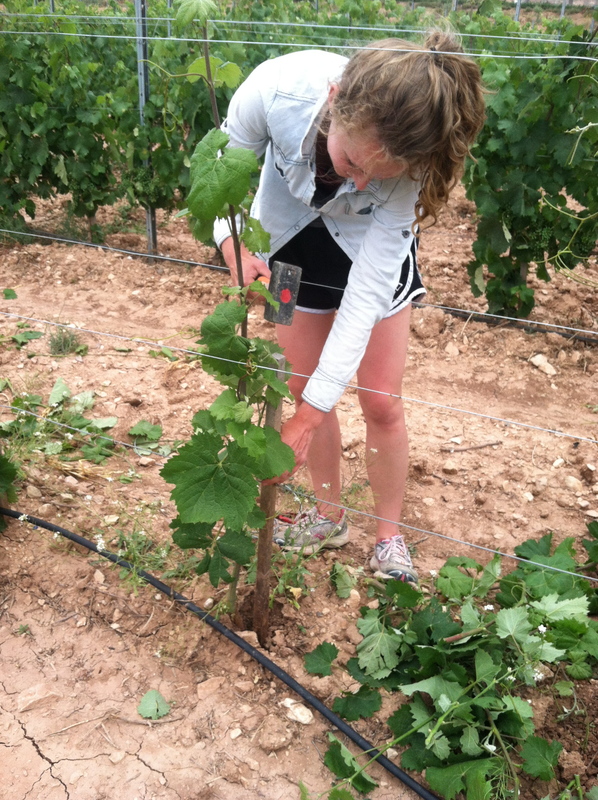 We soon realized after doing a more advanced sweep of the field that the majority of the plants were infected. 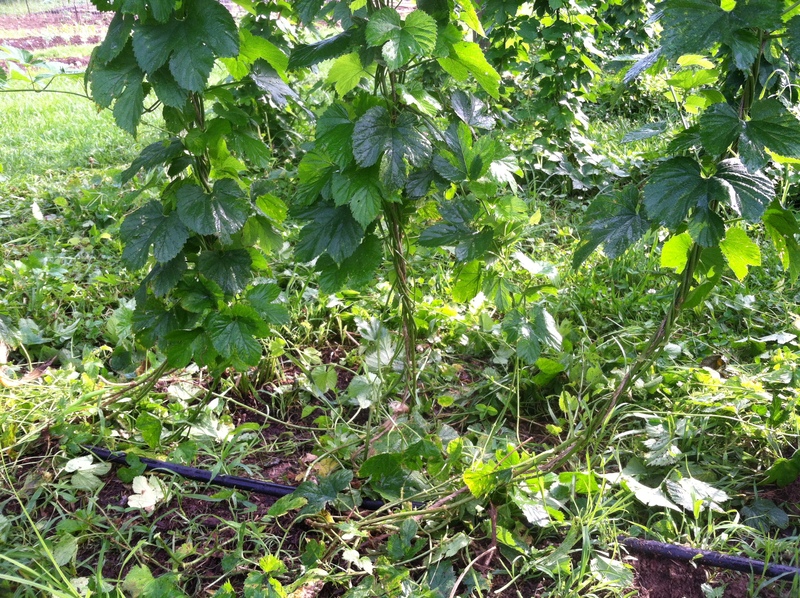 Our next mode of action was to completely weed the beds of all the hops and strip all the leaves and new growth about 2 feet up the plant. This was extremely time consuming and labor intensive and took us about a week and a half. In conjunction to this we began using a fungicide called Zerotol to help control this problem. We used a mixture of 2 oz. Zerotol, and a gallon of water. We then used hand sprayers and individually sprayed every plant. This was another job that took a lot of time to complete and was also a health hazard if the person spraying wasn’t wearing the proper protective gear. We continued to spray about twice a week for about the next month and a half. 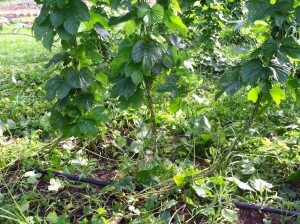 The mildew eventually subsided and seemed to have mostly gotten under control. The weather continued to be rainy throughout the summer and never seemed to be normal. This spring I took a class about Climate Change and Food Systems and learned about flooding and the problems it might cause our farmers. I feel like I definitely experienced the challenges that a rainy season brings and it helped prepare me for the some of the problems I might encounter later down the road with other jobs I have.